Pay Me is a form of Contract Rummy for two to eight players. Much like in Three Thirteen Rummy, the number of cards dealt changes on every hand, and so do the wild cards! The object of Pay Me is to be the first player to form their entire hand into melds. 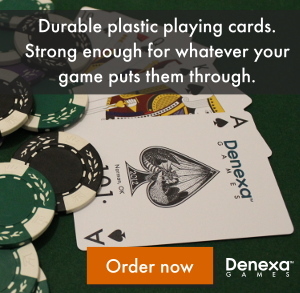 To play Pay Me, you’ll need a few decks of Denexa 100% Plastic Playing Cards with jokers included. The number of decks you’ll need depends on the number of players you have. One deck is just fine for two players; to play with three or four you’ll have to shuffle two decks with the same back design and color together. For five to eight players, add a third deck. You’ll also want something to keep score with, like pencil and paper. The number of cards dealt changes on each hand. Deal each player three cards for the first hand of the game. Deal four cards on the second hand. Continue on in this fashion, with the hand size increasing by one on each hand. 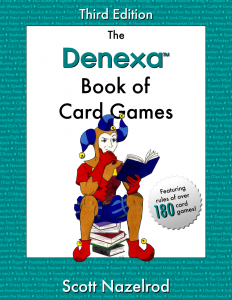 For the eleventh and final hand, each player will receive thirteen cards. After the cards have been dealt, place the deck stub in the center of the table. This stack of cards becomes the stock. Turn the top card of the stock face up. This card, the upcard, will be the first card of the discard pile. 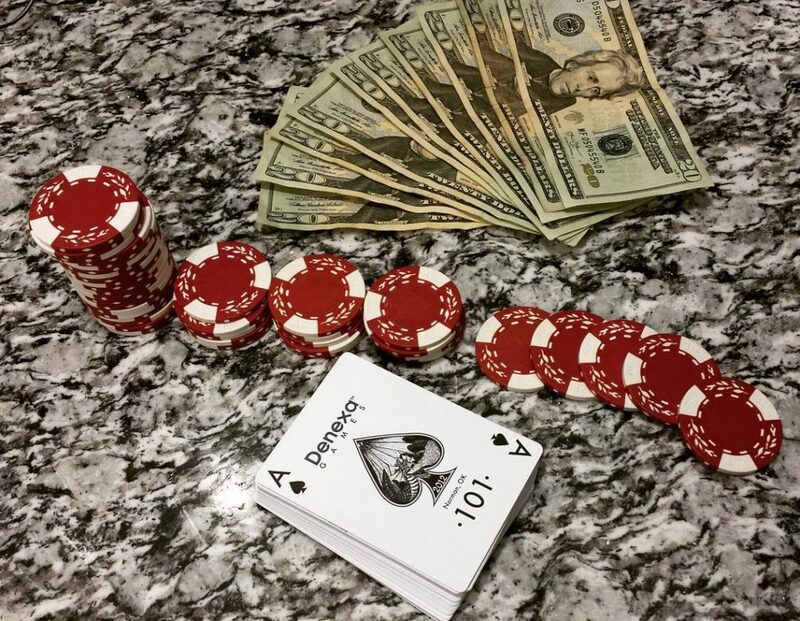 Play starts with the player to the dealer’s left. Game play follows the usual Rummy pattern. A player starts their turn by drawing one card, either the top card of the discard pile (which is face up and known to the player) or the top card of the stock (which is unknown). The player then discards a card, ending their turn. Pay Me, like all other rummy games, revolves around forming one’s hand into special combinations called melds. There are two types of melds: sets and runs (also known as sequences). A set is three or four cards of the same rank and different suits. Suits cannot be duplicated in a meld; a player can, however, have two separate melds of the same rank. A run consists of three or more consecutively-ranked cards of the same suit. When a player forms a meld, they keep it in their hand, rather than laying it on the table as in some other rummy games. One unique feature of Pay Me is its use of wild cards. Jokers and 2s are always wild. In addition, the rank that corresponds to the number of cards dealt is wild, too. For example, on the first hand, when three cards are dealt, 3s are wild. On the next hand 4s are wild, and so on. On the ninth hand (consisting of eleven cards) jacks are wild, followed by queens on the tenth hand, and kings on the eleventh and final hand. 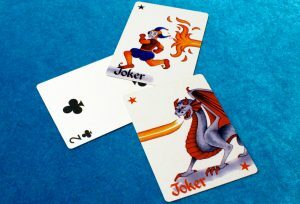 Wild cards can substitute for a card of any rank, or can be used as a card of its natural rank (except for jokers, of course). However, there are some restrictions on the use of wild cards in melds. No more than half of a meld can be wild cards. Additionally, in runs, two consecutive cards cannot be wild cards. 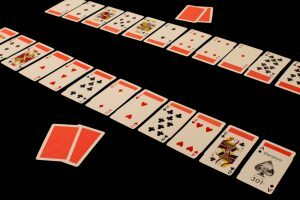 When a player has formed their entire hand into melds, they may go out by declaring “Pay me!” If they have a discard they would like to make, they can do so, but are not required to discard if the card can be melded. Each player then gets one final turn, during which they cannot draw from the discard; they must draw from the stock only. When the turn reaches the player who called “Pay me”, the hand ends. Each player lays their hand face-up on the table, separated into melds. If a player has cards in their deadwood (unmatched cards) that can be used to extend melds held by the player that went out, they may lay off those cards on those melds. A player cannot lay off on melds belonging to any players other than the one that went out. A player also may not substitute cards they hold for wild cards in other players’ hands. Each player’s deadwood total is then added to their score. Game play continues until eleven hands have been played. The player with the lowest score at that point wins the game. After you’ve chosen the poker tournament structure you want to run, the next step is to select the buy-in. You’ll also want to decide how many chips, and in what denominations, to issue to starting players. Both of these will dictate how many chips you need to have on hand for the tournament. Handling the buy-in process itself can also be a source of stress for new tournament directors. Fortunately, addressing these concerns is fairly straightforward. A little thought and planning here greatly increases the chances of your tournament being a success. How much is the buy-in? The most important question to your players is probably how much the initial buy-in will cost them. Some players are happy to potentially lose a lot of money to participate in the excitement of a big tournament. Others would be just fine buying in for $0 and playing for bragging rights. Set the buy-in too high, and some players won’t be able to afford to join in. Set it too low, and some players might feel that the several hours the tournament will take won’t be worth their time. The simplest thing to do is to ask the people you want to invite how much they’d like to spend. If you can find a sweet spot that attracts the most players to your tournament, you’re golden. Otherwise, you may need to split your guest list into two, and run a separate tournament later for the folks that aren’t interested in the first one. One of the things that dictates the length of your tournament is the proportion between the starting stack size and the blinds level. The larger the blinds are in proportion to the starting stack, the faster players will bust out of the tournament. Tournament starting stack sizes are often expressed with a “T” followed by the amount of chips given at the beginning. This “T” (for “tournament”) represents a fictitious currency that the chips are denominated in, which has no relation to the real-life currency the buy-ins and payouts take place in. Thus, a T100 tournament issues 100 units worth of chips to its starting players, and a T1,000 tournament issues ten times as much. Both of these tournaments could have a $5 buy-in, or $25, or whatever the tournament director decides. Again, starting stack sizes’ relation to the blind levels dictate the length of the tournament. A T100 tournament should theoretically play exactly the same as a T1,000 tournament with blinds set at ten times those of the T100 tournament. Of course, some players may be susceptible to a psychological difference—a T1,000 tournament might feel like a “bigger deal”, and a T5,000 or T10,000 tourney might feel even bigger than that! Larger starting stack sizes can also give you more flexibility in customizing your blind sizes. The one drawback to a bigger starting stack is that you may need more chips to cover all of your players. Naturally, the most important thing to keep in mind when determining your starting chip stack is that the denominations issued are compatible with the blinds schedule. If the first round of blinds is T20-T40, and the smallest chip you issue is a T25, your tournament is not off to a great start. A good starting point in coming up with a starting stack is to follow the ratio 1:2:3:4, where for every chip you have of the highest denomination, there is two of the next-highest denomination, and so on. 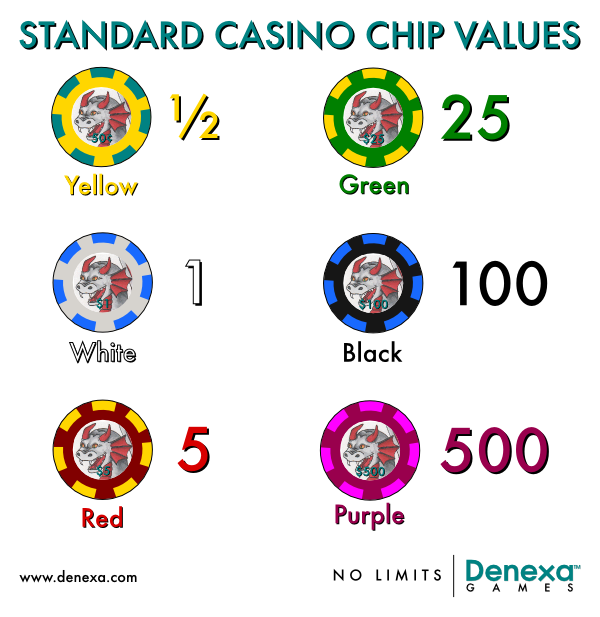 Using more than three or four chip colors is generally not very effective; it is more expensive, and you’ll need to do more chip color-ups throughout the tournament. Just like the tournament size, there’s a psychological aspect to choosing a chip breakdown. You could theoretically run a T1,000 tournament by simply giving everyone 40 T25 chips. But 40 chips may not feel like very much to some players, leading them to play much more tightly than they otherwise would, lengthening the tournament. Instead, you can use some T5 chips to give each player a hoard of chips to start with. If you start each player with 28 × T25 and 60 × T5, for instance, they now start with 88 chips. Despite both adding up to T1000, the second stack starts them with more than double what they would have with just T25 chips. With the starting stack sizes decided, it’s simple to determine how many chips you need. Just multiply the number of chips of each denomination in each stack by how many players you expect to have. It’s probably a good idea to have enough extra chips for a few extra players. That way, you’ll be covered if something unforeseen happens and you need them. If you plan to allow rebuys, be sure to account for those in your inventory as well. It’s generally fine to simply issue a few large-denomination chips (like ten T100 chips or two T500 chips for a T1000 rebuy). When a player has to rebuy, all of their low-denomination chips have ended up with the other players. A rebuying player can simply break their large chips down by making change from those players or the pot. This keeps a rebuy from flooding the table with low-value chips. Now that you know how many chips to buy, it’s time to actually get your hands on some. It’s a good idea to choose chips of a unique style from an online vendor. If you go with one of the sets of chips readily available at your local big-box store, like the ubiquitous dice chips, you run the risk of one of your players owning the same chip set. Unscrupulous players may notice this and sneak in chips from home to give themselves an advantage. If you plan to host regular poker tournaments, it may be worthwhile to invest in a customized chip set. You can have the chips printed with a unique logo or text inlay. This can be expensive—expect to pay $1 or more per chip. However, it neutralizes any threat of foreign chips, and lends a much more professional image to your game. What chip colors should you choose? The standard ones, of course! Any players that have participated in a casino poker game will instantly understand your chip values. That way, those players can be the ones to explain the chips to the newbies. That saves you from having to run from table to table to remind everyone, no, the purple chips are actually T20 in this tournament… Besides, if any of your new players later go on to play in casino poker games, they’ll appreciate not having to learn new chip colors. Chip colors are not as standardized above the 500 level. You may need to improvise a bit if you need chips valued that high. Chips valued 1,000 are often orange and 5,000 chips are often grey. You may also be able to get away with repurposing yellow and white chips for higher values if necessary; there’s not much call for a T½ or T1 chip in a T10,000 tournament. Blue chips have no standard value, but are often readily available. They are often seen as $1, $2, or $10 chips in casinos. You can use them for any of these values, or for higher denominations. Nothing will ruin a poker tournament more than, when it’s time to pay the winners out, having nothing to pay them with because it’s been stolen. It’s also important to remember that chips represent a monetary value, just like cash does. So be sure to treat them like cash. A busy tournament director is going to be running from table to table, settling rules disputes, settling seating arrangements, managing color-ups, ensuring the blinds schedule is being followed, and more. You simply aren’t going to be able to devote your attention to keeping an eye on the prize pool and extra chips. Both cash and chips need to be secured at all times. Before players arrive, set up some kind of way to secure your cash and chips. A simple option is to use a basic cash box. For your chips, you may need something like a locking briefcase or a larger lockbox. If you use a birdcage-style chip carrier, it can be secured by placing a large-hasp padlock onto the handle, so the cover can’t be removed. If possible, the best option is to place cash and chips into a safe or locking drawer in a large piece of furniture like a dresser or desk. After all, while someone could theoretically slip your cash box out of the room for later enjoyment, it’s a lot more obvious if someone tries to steal a chest of drawers. There are a couple of preparations to make before the day of the tournament arrives in order to ensure the buy-in process goes smoothly. You will greatly speed things up the day of the tournament if you’ve already portioned your chips into pre-made starting stacks. Putting each starting stack into a rack looks quite professional. You can hand the whole rack to the player as they pay for the buy-in. However, depending on the size of the tournament, it may get expensive to have enough chip racks on hand. Fortunately, there’s a number of alternatives; you can use plastic zipper bags, Tupperware-style bowls, or small boxes. Another interesting option is to put the chips in foam can koozies. Not only does this keep the chips contained, it gives the player something to keep their drink cold with. Before the tournament, be sure to go to the bank and get change. Some players may arrive at the tournament having just hit the ATM and needing change back from their buy-in. You will also probably be dividing the prize pool between a number of players, so be prepared for the possibility of having to pay out odd amounts. Of course, whatever change you don’t use can be brought back to the bank afterward, so don’t skimp out. Everything’s set up and the players are starting to arrive. What now? Have each player come up one by one to a cashier station set up in a convenient location. As they give you their buy-in cash, return any change necessary. Before you give them their chips, splash them out and have the player agree that the correct amount is there. This will eliminate any accusations of shortages later. (Having a chip count board as part of your cashier station makes this process smoother.) Send the player to their designated seat and you’re good to go!